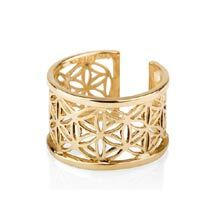 About David Weitzman's Jewelry - Sacred geometry - where science and ancient wisdom meet. 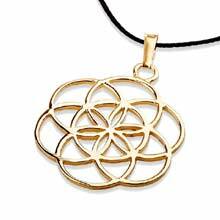 David's jewels are designed from sacred geometry. Sacred geometry is a term which describes the geometrical laws which create everything in existence. This term has been used by mathematicians, geometricians, spiritual seekers, anthropologists, and archaeologists to encompass the religious, philosophical, and spiritual beliefs that have sprung up around geometry in all the major cultures during the course of human history. 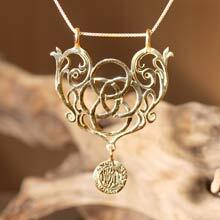 My intention was to create the perfect and most powerful symbol for creativity. A symbol that connects us as humans to the ancient creation stories. For that I took the symbol of the Seed of Life, the cosmic symbol of creation; the mathematical/geometrical blueprint of consciousness itself that can be found in many ancient cultures all over the world. The seven intersecting circles that create an hexagram/six petals flower are actually connected to the biblical story and the first chapter of Genesis about the six days of creation. I used a different symbol to depict each day. The first thing that was created was the light, which also symbolizes consciousness and life, so for the first day I've used the vesica Pisces symbol (the two intersecting circles) which symbolize light, and also the source of creation from which any mathematical/geometrical law can be derived. The second day - water, our source of life here on Earth. I've used the ancient symbol of a fish, which was used in the ancient world as a symbol of fertility. On the fourth day we have the Sun, the Moon and the stars. The sixth day was when the human being was born and for that I've used my symbol for "humanity" - the Phoenician ancient Hebrew letter ALEPH which actually depicts the head of an ox (turn it 45 degrees counterclockwise). The word Aleph means "to cultivate" and indeed cultivation and creativity is what I believe define us as humans. 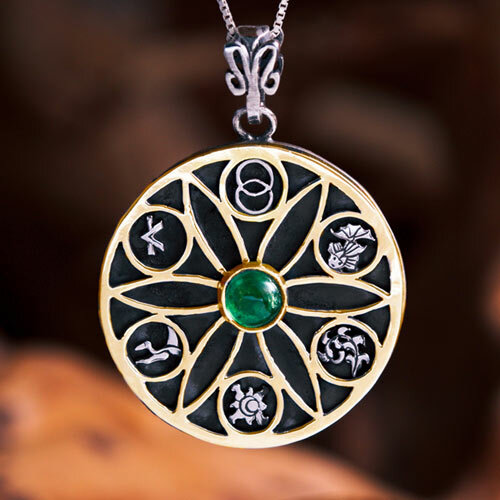 The stone I've used for this model (though you can order it with your favorite stone) is a green or pink Tourmaline - the stone of love and protection since many cultures use the symbol of the Seed of Life as a talisman for that purpose.